Adding colour, and 30 years can make quite a difference. Here’s two 1981 images showing the one-year old Law Courts that were part of the re-thought Robson Square complex. In the early 1970s a 50 storey 600 foot tower would have been on the site if the WAC Bennett Government plan had been followed. Instead Arthur Erickson designed the Dave Barrett NDP ‘tower on its back’ that we have today, completed in 1980. It’s still nearly 140 feet tall, and has 35 courtrooms on seven levels, but the most striking thing today is the integral landscaping that has vines trailing from every floor, and trees carefully sited in mounds and pits that create an entire elevated park through the complex, designed by Cornelia Oberlander. Originally the 1,300,000 square foot complex cost $139 million. After thirty years of use it recently saw a multi-million dollar restoration that included replacement membranes and re-sealing the waterproofing throughout the buildings. The waterfall is running again as well, and all the planting was carefully removed and returned, or replanted so there’s still a mature 30-year old landscape. The double row of red maples that line the Hornby sidewalk (and flank the new bike lane) have done a bit of root damage to the sidewalk surface – but nothing like what would have happened in Erickson’s preferred Plane Trees had been planted. Herbert Oliver Lee – generally known by his initials – arrived in Vancouver in 1903 from London Ontario when he would have been aged around 26. Two years later he married Beatrice, who was aged only 20 and from Carlton Place, also in Ontario. The marriage took place in Vancouver where Herbert had already established a grocery store on Westminster Avenue (today’s Main Street), just north of the junction with Ninth Avenue (today’s Broadway). 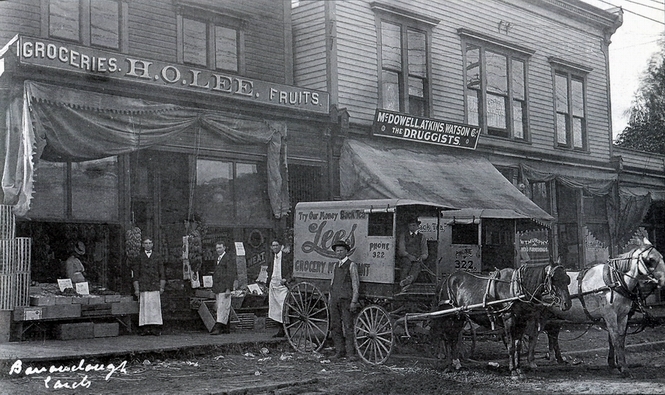 Here’s his store in 1906. The second floor seems to have been a hall, referred to as ‘Lee’s Hall’. Mr Lee must have been successful in the fast-growing city, and by 1907 had apparently acquired a plot next to his store right on the corner of Broadway and Main. The corner was the home of the Mount Pleasant Methodist Church from 1891 until 1909, although it was closed a few years earlier. A 1907 advertisement in the Mount Pleasant Advocate placed by H O Lee said “For Sale or Rent, the old Mt. Pleasant Methodist Church Building.” Clearly he had no takers – or at least none he liked, because in 1910 he hired architect A J Bird to design the Lee Building for the site. There’s just the one reference to this scheme in the Province newspaper, although Mr Lee did take out a building permit for a $100,000 steel framed building that year with W C Stevens to be the builder, and Mr Lee himself as architect (which seems a bit unlikely). Nothing really happened for a year, and when it did it wasn’t Mr Bird’s design that was used. Instead Stroud and Keith were the architects for a $200,000 six-storey building (although as built it’s seven). Allan Stroud was a Toronto based architect who arrived in Vancouver in 1909, partnered with A W Keith in 1910 and designed very few buildings before leaving again after 1912. This is one of only two buildings still standing that the partnership designed, and easily the biggest that was built. It was the largest building in Mount Pleasant for many years, and Mr Lee continued to live in the building with his family. Our 1939 VPL image shows it soon after his death, which was in 1937. His wife, Beatrice, died in 1948. The family apparently lost control of the building due to a debt of $12,000 to the Royal Bank, and eventually the building was sold in a rather unusual arrangement of joint shareholder ownership – almost a strata, but not quite. The building houses a mix of residents, offices and retail stores. The shops are pushed back behind an arcade, but that’s not how Stroud and Keith designed the building. The sidewalk in front of the building was taken for widening Broadway in 1953 and the arcade – which is more like a corridor – was the compromise solution. Fortunately this was achievable with a steel framed building (erected by J Coughlin and Sons, who conveniently had offices in the same building as the architects). The single storey retail stores on the left, on Westminster Avenue included a Safeway store in the 1930s. Today’s replacement buildings are still low, having been rebuilt in the past two years following a fire. Here’s another view up Cambie Street, this time from closer to West 8th Avenue. It’s supposedly 1931, the gas station and billboard we saw in earlier posts were also here – and the Bridgeway gas station appears to heve been owned by General Gasoline and sold Union 76 gasoline. The problem with that is that Union 76 was only introduced in 1932. The name referred to the 1776 United States Declaration of Independence, and was also the octane rating of the gasoline in 1932. In 1910 this was a brand new home. This was just one house, the property of J A Russell that had been completed a year earlier at a cost of $5,000 to the design of W H Milner. Mr Milner became a distinguished architect, but not in Vancouver. He appears to have been responsible for only one other design in the city, but it was a really important one, the $45,000 Vancouver Horse Show building on West Georgia Street, built in the same year as this house. His main practice was in Seattle, although he also briefly had a joint partnership with John R Wilson in Victoria. The huge house was the home of a small family, just father (Joseph), mother (Jessie) and Flora, their 23 year old daughter. The rest of the household consisted of Mary Depford, a nurse, the Domestics, Annie and Fito, and the labourers, John and Frank (Annie’s husband). This clearly wealthy household was the home of one of the city’s most important lawyers, partner with his brother (and other partners at various times) in what appears to have been the most successful law firm of the day. The building that replaced the house is perhaps older that it looks. Chilco Towers was built in 1957 and designed by Kenneth A Gardner. Gardner was born in South Africa in 1919 but emigrated in 1953, and established a successful practice in Vancouver designing two of the first ‘self-owned apartments’ in the city – including this one. These pre-date the legislation that created strata ownership, so they were described as ‘tenant-owned apartments’ and were built by ‘Self-Owned Apartments Ltd’. They cost from $17,000 for a 1-bedroom to $38,000 for 3-bedrooms. The modernist building had (and partly still has) fabulous views – but no balconies. What could be better to locate opposite a prominent billboard than another billboard? Here’s the south-west corner of Cambie and Broadway in 1932 with site occupied by a hoarding. Up the street is the funeral home of Nunn and Thompson, but the entire corner site is taken up with a trio of advertising billboards. There had been buildings here – the 1912 Insurance map shows two structures although the street directory said the store on the corner with Bridge Street (as Cambie was called then) was vacant. In 1941 the corner was still vacant, but there was a new Safeway store next door at 510 West Broadway and there had been stores further west for many years. In 1986 the existing building was built on the corner, and ten years earlier the office building used by the Vancity Credit Union, and now the City of Vancouver, was built up the hill on the corner of West 10th. 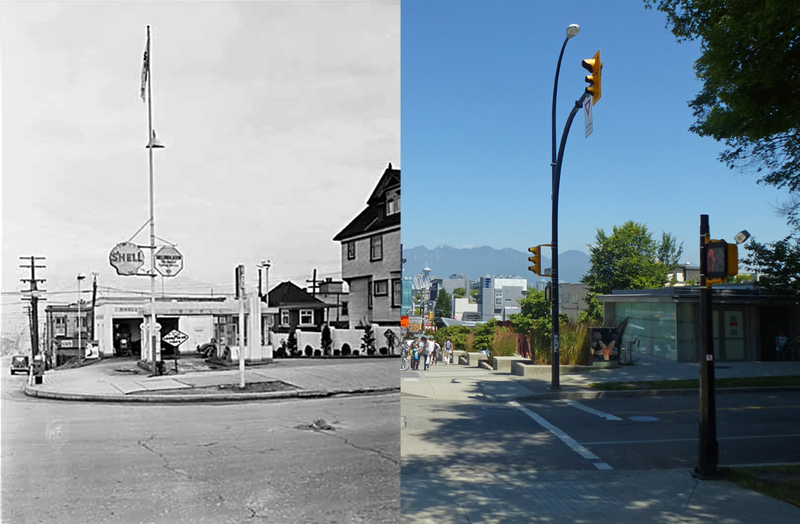 Cambie Street had three gas stations down the hill at West 5th Avenue. There was another on the corner of West Broadway (although on the west side of the street). And here’s another block up the hill, where Shell hoped to catch the drivers coming down Cambie before Standard Oil or Union Oil could get their custom. These 1937 VPL Leonard Frank images show the three pump forecourt, the lube bay, and the rather smart houses along West 10th Avenue. The Park View Service Station appeared in the late 1920s, and was still there in 1950. For a number of years there was a large parking lot – which has now shrunk a little with the addition of the Canada Line transit station in 2009. In 1989 a Royal Bank appeared on the north-west corner of Cambie and Broadway. In the interim during the 1940s the Hall Motor Co operated on the corner, with a cartage firm just down the street, although both had gone by the early 1950s. Before that there was a filling station, as we showed in an earlier post. Alongside and behind the bank was the Fairchild Square – an auto centred mall with small retail stores and restaurants around a central parking courtyard, with offices at the back for Fairchild Radio and TV. The centre was developed by Thomas Fung, the owner of Fairchild Media (which he acquired in 1993). Fairchild went on to develop the Aberdeen Centre in Richmond, and PCI took on development of the site, hiring Peter Busby’s architectural company to replace the bank (who are back in the new building) along with Wholefoods, London Drugs, Lululemon and medical and other office space in a project called Crossroads, completed in 2009.